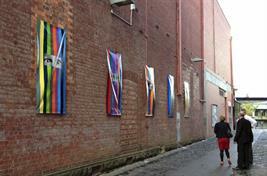 A friend of mine sent me a link to this Arts hub article the other day – it’s titled THIEVES TAKE OFF WITH LANEWAY ART and it’s about a public art in a Ballarat laneway that’s been nicked. All five inaugural works were by Melbourne-based Colombian artist Julian Clavijo, and are estimated to be worth approximately $7,500. ‘I am devastated because it was a quite long process, long hours… and it took time to prepare all these things. The main focus of the whole thing is to share with the public and to put it in a public space for everyone to enjoy,’ says Clavijo. … Clavijo says he might be commissioned to recreate the works, but he is not sure he will comply unless extra security measures are put into place. I think Clavijo, like many artists working in public space, is overlooking an important aspect of placing your work out in a public place. Once you put something in public space you automatically turn it over to the public and ‘the public’ is not one entity with a hive mind, it’s made up of thousands of individuals all with different ideas as to what’s ok and what’s not. So someone, somewhere may well decide to nick it, break it, tag it, destroy it or otherwise do something. You’re putting it in their space, you have to be ok with what they then decide to do with it, otherwise you’re gunna get heartbroken, or pissy, or surprised. My work has been nicked, I’ve had work torn in half, I haven’t yet had anything tagged or graffed, but I’d love that to happen. That’s other artists responding to your work, which is rather cool. There’s no point putting your art on the street and expect people to treat it with the same reverence that people treat art in galleries. It’s just not going to happen. The street is a living breathing Eco system and stuff evolves as the seconds pass. And if you’re going to work on the street, you have to accept you’re becoming part of that. I think it’s not so much that you no longer have rights, but that it’s democratic, so everyone has as much right as you. In a gallery, the artist is king, and there’s security and alarms to stop anyone else attempting to interact/participate/make any mark that they were here. When you put art in public space, you give it over to that public, and everyone gets a voice. Just like in any political system (or indeed, life), not everyone uses their voice for good and sometimes some people are selfish.